Wondering what to get that special person for Valentine’s Day? Well, look no further than lavalamp.com! Our website has the perfect Valentine’s Day gift for everyone. 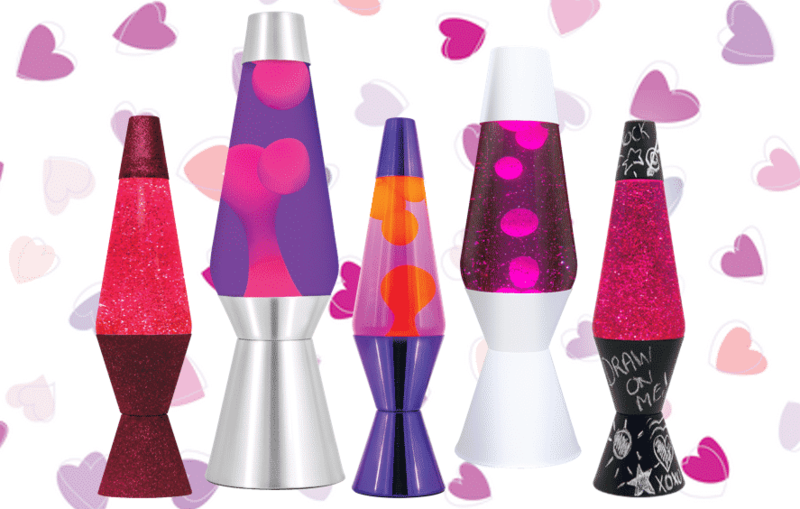 We have Lava® lamps in shades of purple, pink, red and silve to match perfectly with all of your special girl’s decorations and room decor. There are also plenty of classic silver lamps in all colors of the rainbow, if your special girl doesn’t like to be restricted by the traditional ‘girly’ colors. Another great new item this year is our Bright SourceTM line. Bright Source lamps combine a Lava or glitter lamp in the base with a traditional table lamp for two types of lighting. These lamps have been popular as bedside lamps, desk lamps and family room or office lamps. 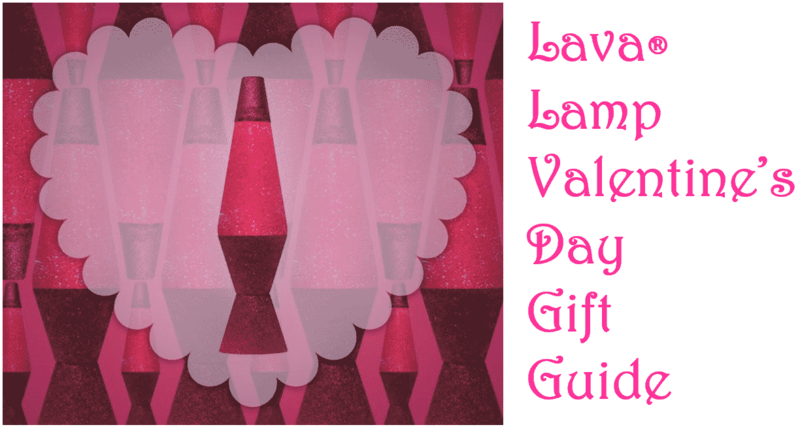 You are sure to find the perfect gift for the lucky lady in your life at lavalamp.com. 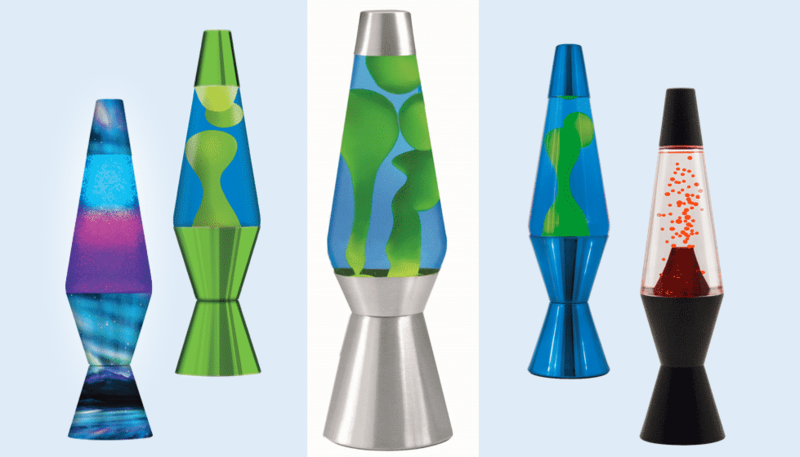 We have Lava® lamps in shades of blue, green, silver, and black, plus a lot of novelty lamps and fun lamps for the man (or boy) in your life. The 27″ grande lamps are very popular with the men: in addition to the blue/yellow above, there are 3 more grande lamps to choose from. Fun lamps have instant start-up action, use LED lights and come in all kinds of themes: volcano, fireplace, sandcastle, tornado, and even an aquarium of (faux) fish! We have string lights, night lights and twinkle lights that run on batteries so you can move them from room to room, or even take them on the go. If you’re worried about the heat of a traditional Lava® lamp for the younger kids, these lamps that do not get hot at all. Also, new this year, we have chalkboard Lava® lamps that come in green lava or pink glitter in the globes and have chalkboard paint on the base and cap that kids can write on, decorate or doodle on for hours of fun. 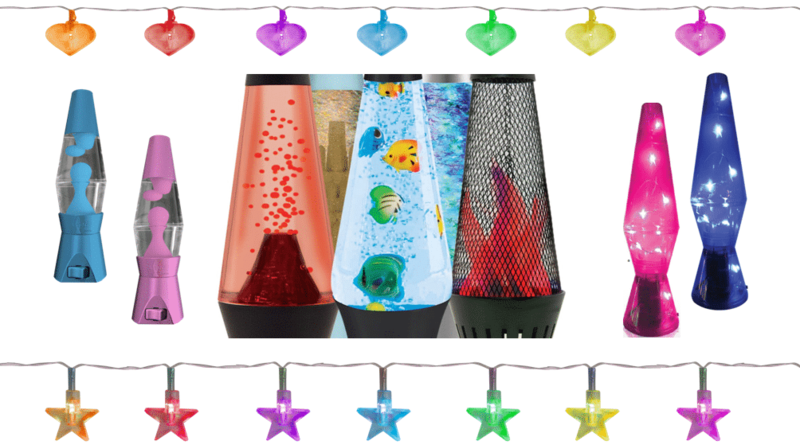 There are plenty of fun Lava® lamp items that are sure to make all of the kids happy! If you don’t find exactly the right base/globe combination, try designing your own 17″ lamp to make the perfect gift for your Valentine. 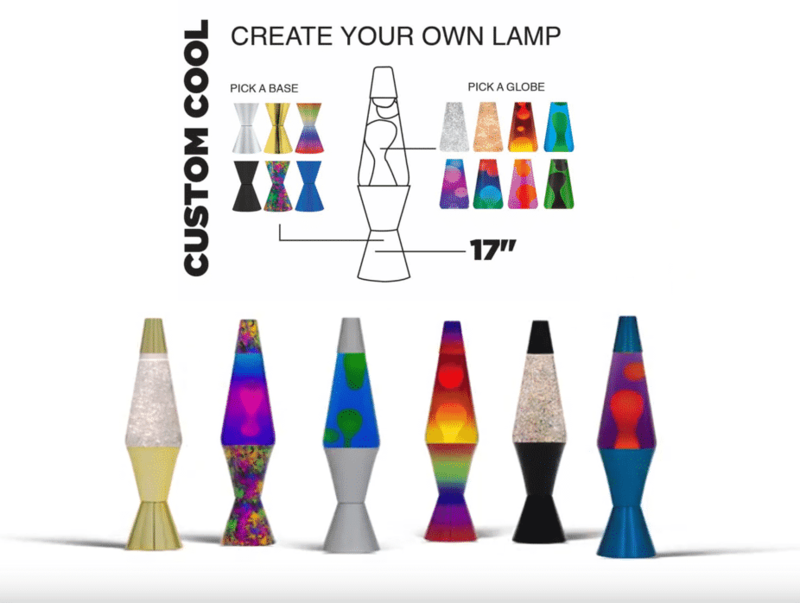 Check out our Custom Cool page and choose from 6 bases/caps and 8 globes to create a unique and personalized Lava® lamp. You can’t go wrong with Custom Cool! And don’t forget, if you spend $50 in our online store, you’ll receive a FREE set of heart string lights through February! It’s a fun added gift, so use code LAVALOVE at checkout to claim yours in time for Valentine’s Day!